President Muhammmadu Buhari last night held a close-door meeting with governors of the ruling All Progressives Congress (APC). Dailytrust reports that meeting, was held inside the conference room of the First Lady’s Office at the Aso Rock Presidential Villa in Abuja, began at 9:00pm, on Tuesday. The meeting took place just 10 days to the forthcoming national convention of the APC scheduled for June 23. The governors of Kaduna, Adamawa, Edo, Imo, Kwara, Kebbi, Kano, Kogi, Benue, Katsina, Jigawa and Ogun States were in attendance. 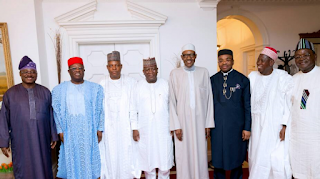 President Buhari had a meeting with state governors under the umbrella APC in April, the main aim of the meeting was to aid the emergence of a former Edo State governor, Adams Oshiomole, as the party’s national chairman.